The Drey is the 2006 Scottish Category 8 winner of the Federation of Master Builders Awards. Spey Building and Joinery Ltd, won the coveted title of 'Heavenly Builders' of the year for their work on this project and to see it is to understand why. 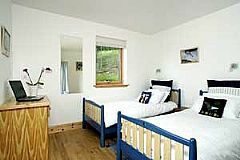 On the road to the Corrieyairack pass close to Lagganbridge the cottage is situated on a south facing slope and surrounded by Scots pine and larch trees. 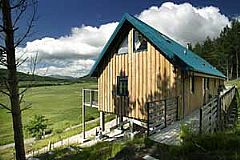 Designed to reap the best possible benefit from the unimpeded and dramatic 180deg views towards Ben Alder and Craig Meagaidh, the Drey has been built on stilts and is clad in locally sourced larch to merge with its woodland setting. Full of character, the property boasts a high cathedral ceiling in the open plan living accommodation, a log burning stove and en-suite facilities. All on the ground floor, there are three bedrooms: 2 x twin, 1 x double with en suite (wet-room shower, basin and WC). A second bathroom has a bath with shower over, basin and WC. The main area of the Drey is open plan and includes the kitchen, dining space and living room. Under-floor heating guarantees a cosy homecoming after an active day outdoors and a wood burning stove ensures all round comfort for evenings in front of the television, (Sky TV with basic package) dvd, reading a book or listening to music or the radio. A starter pack of fuel for the log burning stove is included in the rent and further supplies are available from Laggan Stores Coffee Bothy just 500metres away. The kitchen is fully equipped to cater for eight - expect to find a gas hob with electric fan oven, microwave, dishwasher, fridge and freezer. Extra mattresses for children, a cot and feeding chair are available at a nominal extra charge. All bed linen, extra blankets, towels, kitchen towels and a hairdryer are provided. A washing machine and tumble dryer solve the problem of wet and muddy gear. In the summer, look forward to opening the French doors on to the deck and languishing in the drama of the scenery and the bird life. The grounds are not enclosed, but well behaved pets are welcome at an extra charge of £15 per week, on condition they are kept under control at all times as most of the surrounding land is agricultural. The Drey is accessible for and welcomes wheelchair users. 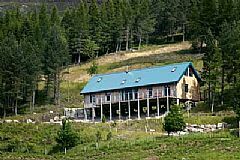 Laggan Wolftrax is less than a mile away. With nearly 18 km of track ranging from the 3.2 km. Blue grade Fun Park to the extremely difficult Black grade trail containing the "2 Ton Drop" and the "Back, Sack and Crack Attack" it offers something for every ability. Newtonmore is just 8 miles away with a variety of shops and pubs, along with a craft centre and two excellent museums. An ideal holiday location with something for all the family! Situated at the entrance to the Cairngorms National Park, Laggan is the ideal base from which to explore the Highlands. Whether its ‘Munro bagging’, climbing, mountain biking, golfing, fishing, skiing, riding, watersports, bird watching or absorbing the atmosphere of Glenbogle, Laggan has it all. Where better than the Drey to enjoy a family holiday, a reunion of friends or a quiet retreat? 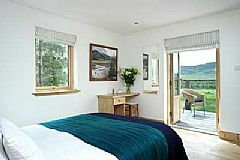 An additional review on cool cottage Scotland is available via the link at the top of this page.